The outline of the plot for the movie Rakhandaar runs around the faith that a common man might hold upon the presence of God. Sadanand, the main protagonist, happens to be a poor man. He somehow manages to survive working in the workshops of a company. The guy is of “happy go lucky” nature. After getting expelled from his job, retaining his faith on God, he turns into an entrepreneur. How does he manage to start his ventures? Who were the parties that handhold him? The movie shall also narrate the way he meets his love. The story is all about to reveal whether if the couple managed to live together happily or not. One needs to catch this movie once it arrives to the cinemas on the twenty sixth of September. Probably then, the audience shall gets a chance to introspect and find out the extent to which they hold their faith on God. 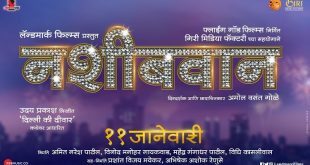 The film has got Ajinkya Deo, Anuja sathe, Jitendra Joshi and Yatin Karyekar in its various important roles. Dr. Mrunalinni patil had handled two important roles of directing and producing the movie while the story got scripted of the pens of Anand More. Keeping tract with the softness of the movie, the music had been directed by Kanakraj. The music director is optimist of showering the beauty of the devotional essence upon the minds of the audience. As per the director, this film is all about the ongoing tassels between the ones one trust in existence of God and the others who defy. Indian cinemas had a rich heritage of dealing with films of philosophical genres and the director is optimist to get the name of the film into the list of such names. The fate for this movie shall only depend upon the audience, the god, whose existence had never been questioned by the men from the silver screen.